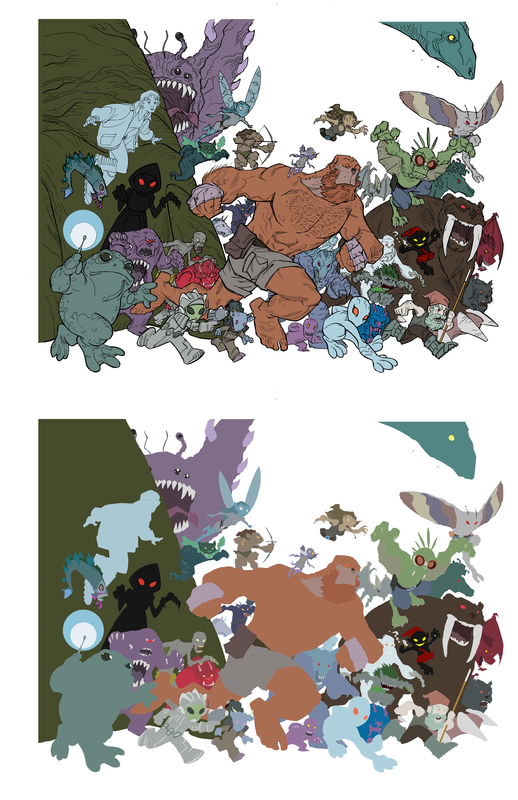 Pretty much as a direct result of my having worked on the Tellos Tribute Volume 2 Hardcover, I was contacted by Todd Dezago and Craig Rousseau back in early September to see if I wanted to assist them with the colors for a wraparound cover to a comic that was to be part of an upcoming Kickstarter project. Now that the Kickstarter has launched earlier this week, I can finally talk about my involvement! I urge everyone to checkout the Perhapanauts Stuffed Choopie + Cryptid Field Guide Kickstarter for more information about the products available and how you can purchase your own cool stuff! I was pleased to be able to be a part of another soon-to-be-published project with some cool guys who do great work! The Perhapanauts mines some very rich history in mythology and urban lore, so there’s really no end to the possibilities. This particular project from Todd and Craig involves a plush Choopie (one of the characters) and an A-Z Field Guide that describes all the various characters. Craig created an excellent homage cover in the style of the old Marvel Handbooks that used to describe their characters back in the day. This was a fun piece to work on for several reasons… Lots of unique characters, twenty-six in total I believe… and I was asked to flat using reference colors. That meant when I was done, it was going to look pretty cool and reasonably like how a final rendering might appear. Typically flatting is done with semi-random colors as the process is mainly just to block out details to be colored later by the colorist. A few times, like on this project, I have been asked to use provided character references to color as appropriately as possible. The image on top is the line art + color flats composited together, while the image on the bottom is just the color flatting work that I provided. I spent most of a day on this one, but it was worth it for how good it looks even without shading and lighting effects. Make sure when you go check out the project Kickstarter that you take a look at the final art for the dust-jacket wraparound cover for the deluxe edition of the book posted in the description. Hopefully I’m going to continue to be able to work on more cool projects like this in the future, and continue working with some cool and creative people! Please let me know what you think and remember, if you are interested in requesting my services as a Flatter, please use the Contact page and provide me with as much information as you can about your request.